The Chronicles of a Dirty Flamingo in the Kitchen | ¡Viva la berenjena, viva la revolución! ¡Viva la berenjena, viva la revolución! Having started a new job a bit over a month ago has left me with more free time than I’ve had in ages. I have one week night off a week now, on which I can do what I please, so we’ve been doing a bit of dinning out. A perk of my new workplace is that my co-workers are actually into food. Imagine that! Every week someone has a fascinating account of what new place they’ve popped into for lunch or dinner. We decided to give St Judes Cellars on Brunswick street a go this Thursday. Panama Dinning Room and The Vegie Bar, so they know what they’re doing! During the walk down Brunswick street one would never guess that such a sleek-looking interior would be hiding inside to pleasantly surprise. We were greeted at the door by a hip-looking floor staff who immediately forced us to make a choice: communal table, bar or single table. We had a look at the empty bar with its modernistic high chairs, the bustling communal tables and the slightly sad looking single table against the wall and went with the private table — the view was way better. The wine list was short and concise with a 50-50 mix of Australian and European wines. There was even a little notice down the bottom advising us that if nothing on the wine list took our fancy we were welcome to choose any wine from the bottle shop to enjoy at our table, as long as we added $15 to the shelf price. We chose a bottle of Spanish white and when we asked waitstaff about recommendations the reply was: the best way to figure out whether we’d like it or not was to have a taste. And we did. We setttled on a bottle and nibbled on bread while we waited for the Mt. Zero olives ($8) and roast beetroot and lentil salad ($14) to arrive. Both the olives and the salad were beautiful. The salted ricotta really complimented the earthy and nutty flavours in the salad. Olives are always great because the accompanying oil makes eating free bread while you wait for you meal a whole lot more interesting! I will give them credit for offering a non-conventional vego option of a quinoa, faro, pumpkin, pistachio and mushroom salad ($21),but I wasn’t feeling adventurous enough to enjoy not one, but two salads in one sitting that night. I decided on a side of buttered sugar snap peas ($8), and filo parcels of ricotta, nettle and citrus ($18). I hadn’t planned on indulging on a side dish, but the waitstaff informed me that the entrees were quite small to enjoy as a main. She was right. I’ve never eaten nettle before, but it’s a serious contender if you’re a spinach or leafy green lover. No complaints about the food. At all. The food even arrives on a charming little wooden board that they place in the middle of the table for any grazing and/or sharing purposes one might experience during a meal. Dessert consisted of a glass of Pedro Ximenes and a glass of Creme sherry. Both excellent and highly recommended with any cheese. My only concern was that the portion sizes might have erred on the small side, but with the rise in food costs, global warming and market crashes, what is one to do? A visit to St Jude’s Cellars will leave you feeling good about yourself, even if you opt for the lonely looking private tables against the wall. It’s a fresh breath of sophistication for Fitzroy. This once-yearly event is usually set aside for that special time of the year when it’s finally safe to come out of hibernation from the winter months and get rid of all the rubbish we’ve been hoarding all winter — including the things we couldn’t bare to part with several spring ago. Yesterday I went through my wardrobe and got rid of everything that I haven’t worn since last year. I neatly folded everything, placed in an empty French Connection shopping bag and placed it next to the chair in my bedroom. The bag will probably sit in that exact location well into the heat of summer and might possibly see the first throes of autumn. The arrival of Spring also means that we must seriously start contemplating the arrival of the warm summer months and begin to think about the long list of “I can’t wait until summer comes so I can…” to-do’s. Summer means longer days, balmy nights (most of which I will spend slaving away in a hot kitchen as is the nature of my chosen profession), the revival of street cafe culture and dinning al fresco. As a recently engaged gal, planning a wedding that is 18 months away has been very time-consuming. I still do find time to cook and eat and work…miraculously enough! Here are some photos of my proudest kitchen moments from the past weeks. In order of appearance we have, roast portobellos with lentil salsa and a snow pea tendril salad, followed by an eggplant and chili rice pilaf and last, but hardly least, butternut squash, chickpea, chili and mint soup. I’ve been working on food presentation ideas, as most vegetarian dishes seem to be a bit flat and lacking the excitement of meat-centred dishes. Even though I don’t care for mushrooms, at all, I’d scarf those down in a heartbeat! The death of SOS (the supposed vegetarian restaurant in the upper levels of Melbourne Central shopping centre that focused on sustainable seafood) and the birth of it’s little sister, 100 Mile Cafe (resurrected in the same exact locale) have created quite a buzz in our household. Anytime we read about it in the papers or passed by it’s mysterious, seemingly non-penetrable exterior we vowed to have a meal there. That was of course, when our budget was non-existent and our bank balance was hovering at ground zero, anything beside a glass of tap water and a bowl of olives to share was out of the question. With both of us earning decent wages we’re able to actually venture out to places NOT gracing the pages of The Age Cheap Eats and dabble in The Good Food Guide from time to time. We paid the 100 Mile Cafe a visit on an unsuspecting Tuesday when I was released from work at a decent hour. 100 Mile Cafe is a concept restaurant that aims at doing it’s part to reduce food mileage and leave a light footprint where ever it should step. The majority of the menu items are not from more than 100 miles of the restaurants jurisdiction. The menu seems to change often, as the menu online just 2 weeks ago has already been replaced with one that has heaps more vegetarian options! When the restaurant first opened the vegetarian option was a sushi plate, when I went it was sukiyaki. When we dined there, the pizza oven was out of commission that that eliminated some options. We opted to share a serve of spelt bread with olive oil and Geelong sea salt while we waited for our mains. I remember having to choose between a lentil dahl and vegetarian sukiyaki, not whole wheat spaghettini, house-made vegetable dumplings, or zucchini flowers that are now on the menu. I opted for the vegetarian sukiyaki over the lentil dahl and don’t quite remember the world crashing down around me it was so good. The spelt bread was light and tasty, but it was more like pita chips with the olive oil and sea salt already baked into the product so there was absolutely no dipping or sprinkling permitted while we were enjoying a bottle of pinot gris (which was excellent at $40 for the bottle). The only difference between the sukiyaki here and the one I usually get at the Japanese Ramen House down the street is the absence of a thickening agent in the sukiyaki sauce. Although it was delicious, the vegetables didn’t taste fresher, the rice didn’t feel fluffier; the only notable difference was the price. My partner had fish for his main and while that was good as well, he was not impressed. For around $100, give or take, we enjoyed a good-tasting, yet unremarkable meal, with a nice view, great staff and zen-like interior. The hype created by the media didn’t match our dining experience, which is unfortunate, as the place has a lot of potential. I’ve been cooking every week, going out to eat every week and sometimes even taking photos of the food I make — the photos never make it off my computer! Yesterday was an exception, as I got out of work at 3pm, and when I arrived back home I spied a new magazine on the table. When I ripped off the plastic I saw it was my monthly issue of Delicious. I’ve been really keen to cook cakes, biscuits and pastries every week so that I can get the most use out of my brand new cake stand and immediately decided on this delicious sounding little cake make with olive oil and white wine. Two of my favourite food ingredients. In about an hour and a half a I had this beautiful cake with a missing wedge perched on my cake stand calling my name every time I passed by. 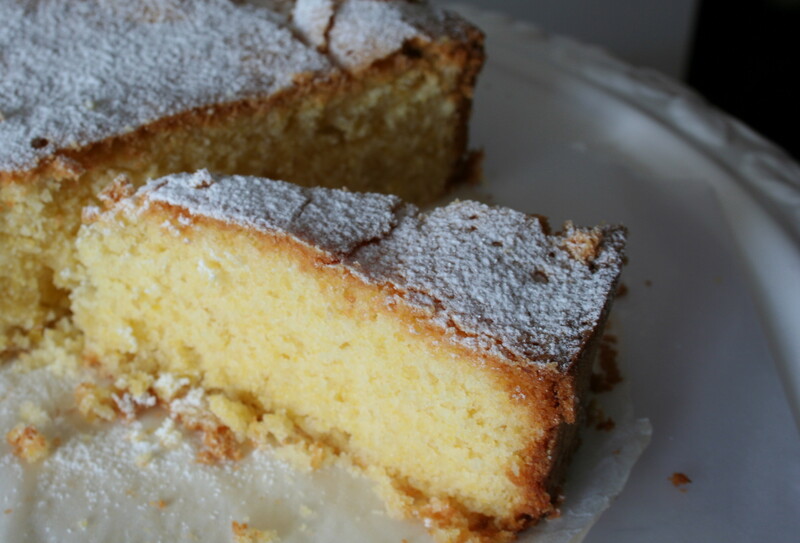 A slice of this cake straight out of the oven offers a delicate, crunchy crumb due to the addition of polenta. The day after, you get a bite that’s more firm, yet still delicate with a more uniform mouth feel — the polenta seems to have absorbed some of the moisture of the cake and made it easier to slice (read: too easy to eat). If you want something a bit different, with a smooth mouth feel that’s not lent to butter than this is your cake. I can practically hear it beckoning me to life the cake dome and have another slice. It’s not even mid-day and I’ve already had two! Preheat your oven to 160 . Grease and line the base and sides of a 24 cm springform cake pan. Place the eggs and sugar in a clean bowl and whisk until the mixture is thick enough to form ribbons when you trail the surface. Next, gently beat in the white wine, olive oil, vanilla and lemon zest. Sift over the flour and baking powder. Finally, using a metal spoon (I used wooden…), fold in the polenta until just combined. Pour your mix into the cake pan and bake for about an hour until a skewer inserted in the centre of the cake comes out clean. Allow the cake to cook for about 15 minute in the pan before removing it from the springform and transferring it to your serving plate or glorious cake stand. Dust your slice with icing sugar for effect and enjoy with ice cream for happiness. Geez. I forgot I had a blog for a few moments there! Good news! I’m leaving school at the end of the semester and getting my life back! The course content was a bit misleading, not to mention, useless at this point in my career. The actual reason I enrolled was out of desperation to remain legal in Australia with a minimal price tag…but it’s just wrong and pointless. The semester ends mind-June and once again, I will be a free, blog-writing woman. It’s taken me an absurdly long time to write about my much-anticipated outing at Movida, but the truth is…it was so authentic that my anticipation overshadowed the actual experience. Let me explain…I went to uni in Spain and spent 3 years living there. I came to know my vegetarian options quite well, which were actually quite limited. I lived in the university halls, share-house and with a host family in both Madrid and Sevilla. I went to Valencia to eat paella at the very place Hemingway once did, only I had to get mine next door because we made it to the beach-side restaurant a few minutes to late. I’m not claiming to know everything about Spanish food, but I know vegetarian tapas! As soon as I was handed the menu I opened it up hoping my eyes would be star struck by terms such as “foam” or “sorbet” or any other word associated with molecular gastronomy. But, there was nothing. To kick start my Spanish experience, I chose with the sidra, Spanish cider to quench my curiosity. Sidra is a carbonated beverage one could easily purchase for 2 euros a bottle in Spain a few years ago. At $7 a glass, which came with a smart glass to drink from at my own leisure, it was decidedly much tastier than any of the stuff I guzzled during my uni days in Spain. As a sipped on my bubbly, the server placed a complimentary bowl of sourdough bread in front of us, which was quickly devoured with lashings of fruity extra virgin olive oil. I’ll keep this short and sweet: I found the vegetarian options rather boring for the following reason. I ordered queso manchego ($3, not suited to sharing) because it reminds me of the bocadillos, baguette sandwiches, I snacked on in between classes. The miniature wedge of cheese was followed the croqueta ($3, share-able if everyone takes one bite) and then patatas a lo pobre, which is a mixture of potatoes slow-cooked with olive oil, strips of red capsicum and brown onions. I ate patatas a lo porbre several times a week when I lived with my host mum in Sevilla and I also make it from time to time when I want something filling and reminiscent of my time in Spain. The vegetarian options were not exciting because I eaten so much of these dishes in the past seven years! This is by far the most authentic Spanish restaurant I’ve eaten at outside of Spain; prices were acceptable, the menu options were acceptable, the atmosphere was acceptable. It was all really Spanish, in my opinion. Asadillo ($10), Marinated roast capsicum and tomato salad, in Moorish spices; Espinacas con garbanzos ($9), sauteed spinich with chickpeas & spices, and Ensalada valenciana ($8), Valencian salad, endive, orange, palm hearts and manzanillo olives. The entire meal cost me about $15, which was fantastic for my pocket, but I was rather disappointed that my all-time favourite Spanish dish (tortilla española), which is traditionally vegetarian, was laced with cod. Overall, it was pleasant. If I were a meat-eater, perhaps it would have been out of this world. Either way, reservation as essential.